To continue the Oldhammer series, introducing on how to tackle such a project. If we compare it to restoring an oldtimer / classic car, you would decide for a brand and car, narrowing it down which build and mark you are looking for. I suggest a similar approach to an Oldhammer project. Especially for the beginning, it might make sense to narrow it down to a smaller core and later on extend the project. Of course Oldhammer isn't limited to 40k, you could do this with Warhammer Fantasy, Rogue Trader, Blood Bowl or any other game system that Games Workshop covered before 1992-98. 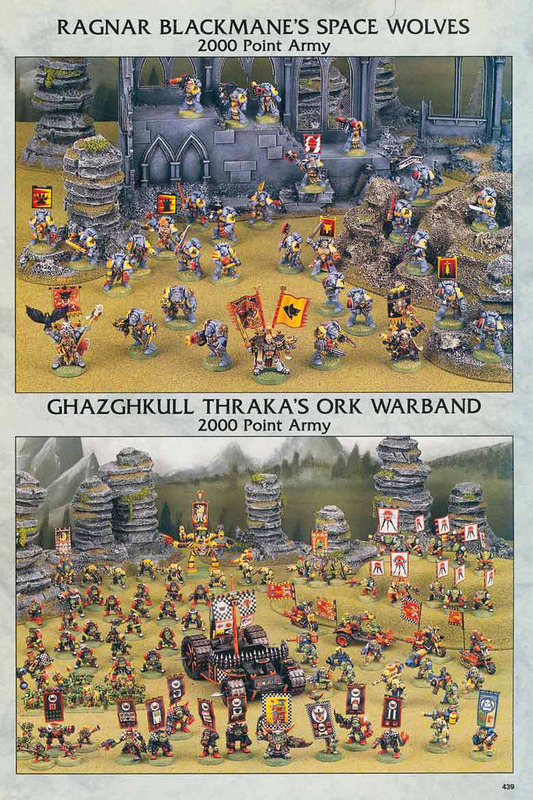 One of the army bundles would be a solid starting ground, as they cover a determined and tractable number of miniatures, thus being not that costly (of course, varying what army you go for, Chaos Dwarves are a total different book than Space Marines). 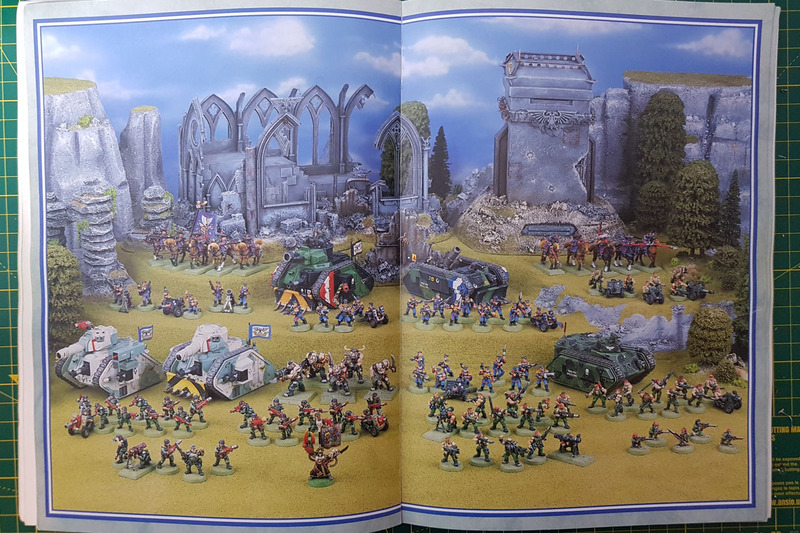 I for example went with the Imperial Guard range from the 2nd edition, and focus on a squad of each of the regiments / units available during that period, using the old Codex supplement as a guide. But where to begin? Well, with classic cars, there is lot of literature and magazines, covering the restoration process, hints and guides on choosing the right car for your experience, skill and budget. We do not really have that for Oldhammer or retro projects, therefore I'll try to give you an open guide with some general tipps that might or will be helpful with your own projects. As I already own a lot of miniatures from the 2nd edition era, I did some stock taking, to see, where my collection has gaps and what I would need to acquire to complete the project. 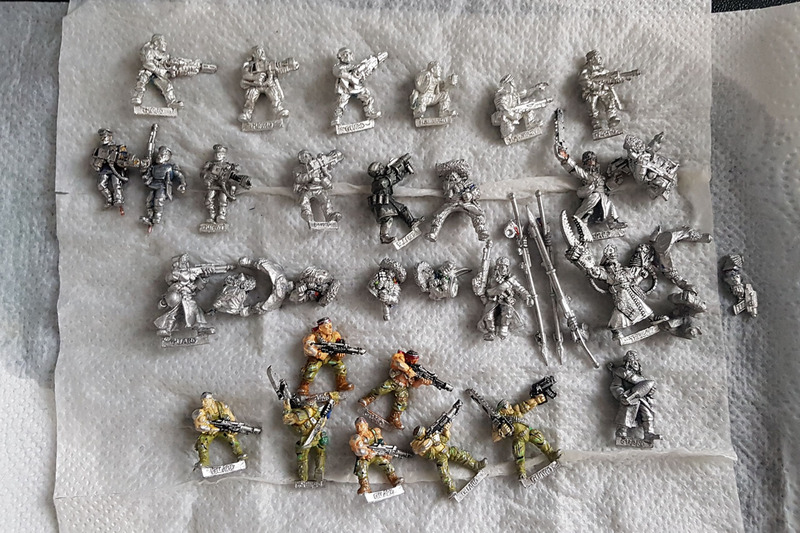 I laid out miniatures, inspected them if they were complete and undamaged and cross referenced them with the catalogues, to see if I was missing some cool poses or options, that I would like to contain in this project. 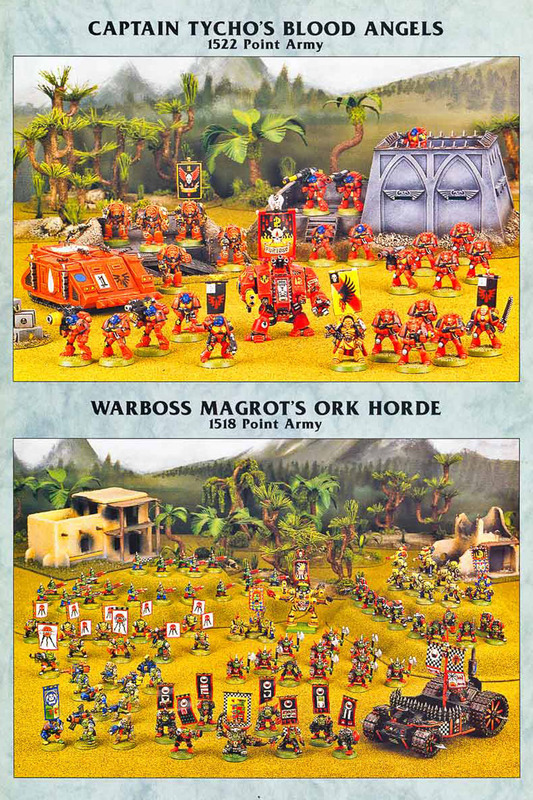 You can try to get your hands on one of the annuals, as they combined the back pages with shots of the miniatures and sprues, that were shown in the back of the old White Dwarfs. Those aren't cheap, so Stuff of Legends and their collection of scanned catalogues will come in handy. I made a list, with all the things I didn't have and went online, looking through market places and boards, as well as bring & buys to find those old miniatures. I'll go into detail, where and what to look for in an independent article. 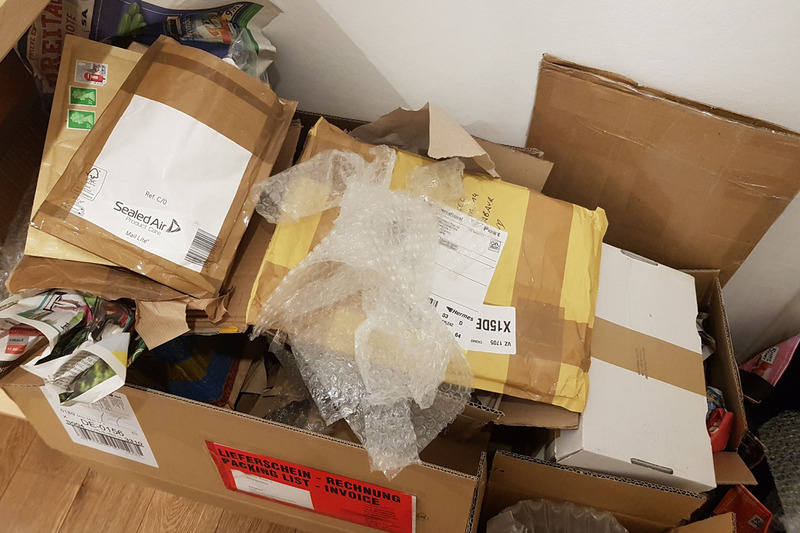 Just saying, I was busy and for a couple of weeks, almost every day or other day a package or padded enveloped arrived, containing another puzzle piece for this project. Make sure to set yourself a budget. What you're willing to spend in total, or at least per month. You're not in a hurry and the hunting for parts is part of the experience and fun, so don't rush and lose track of what you're spending. Sometimes you're lucky and you get new, untouched miniatures. No hassle of removing paint or glue. N.I.B., new in box, or in our case new in blister, is hard to come by, but not impossible. 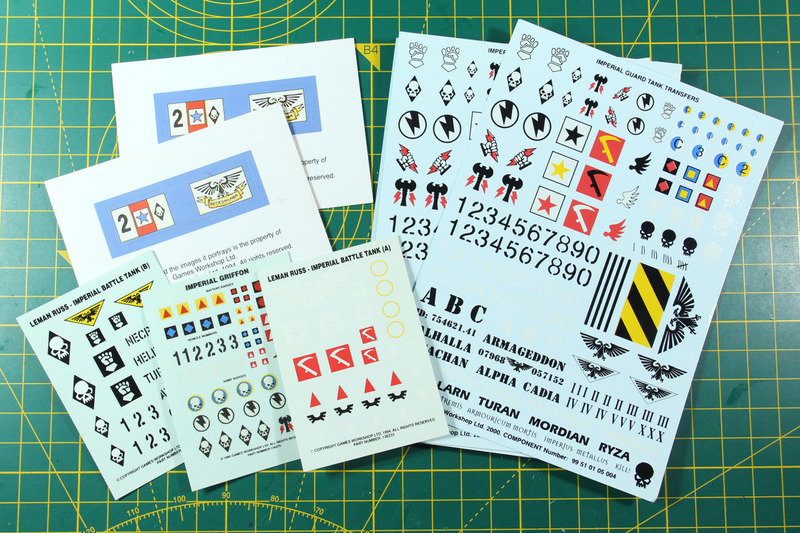 Depending on what you want to realize, it makes sense to collect some accessoires, like decals, banners or smaller bits. Especially the later come in handy, as older models, especially plastics and vehicle, are missing bits or maybe damaged. So it is practical to have some spares. 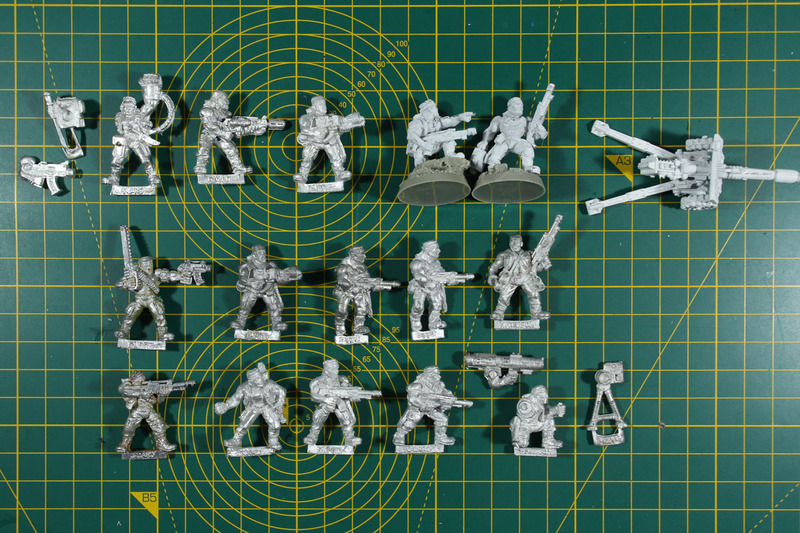 When you're looking for old metal miniatures, you come across different types of condition. 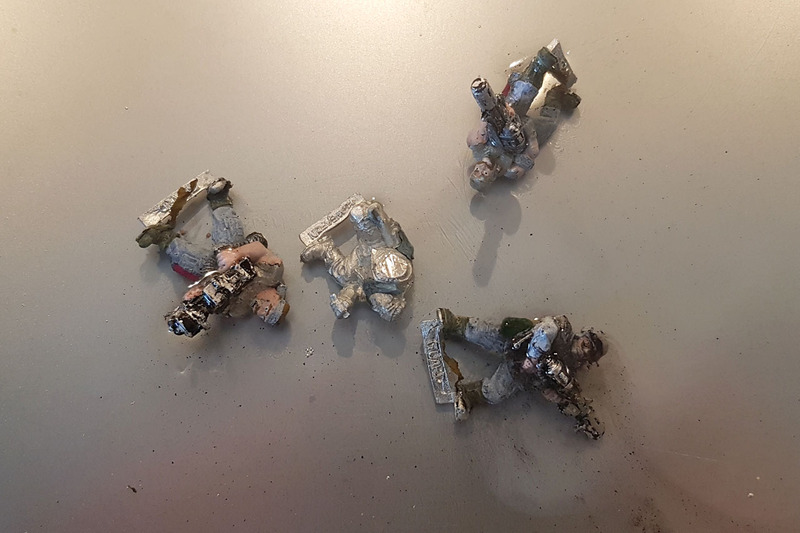 Lead rot isn't really a big problem with the miniatures from the 90s. 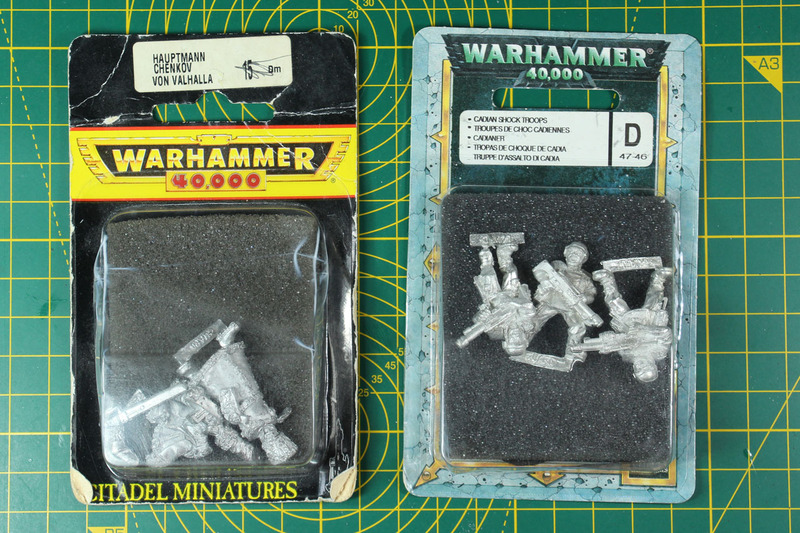 But the 90s miniatures will be a different type of colour compared to the "White Metal" that was introduced in 1998. The colour of the pewter / lead can change during stripping paint or depending on what primer the previous owner used. 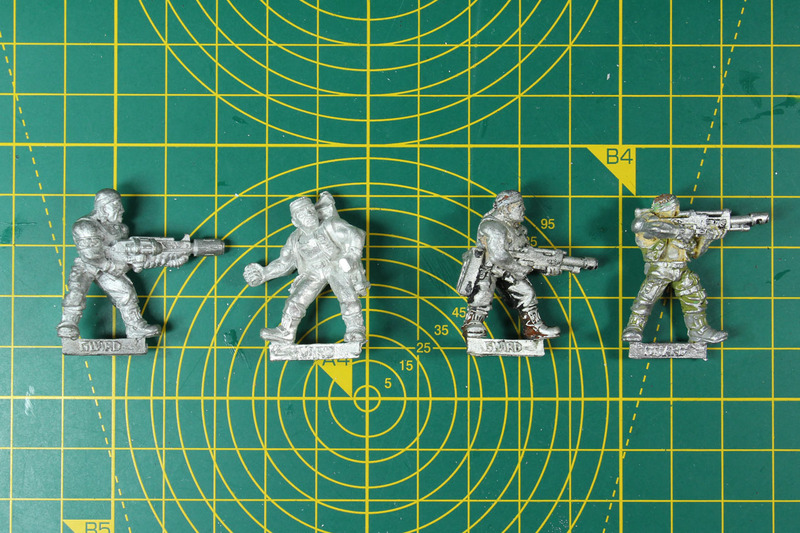 Biggest advantage of lead miniatures, they are rather simple to paint strip compared to plastics or resin models. 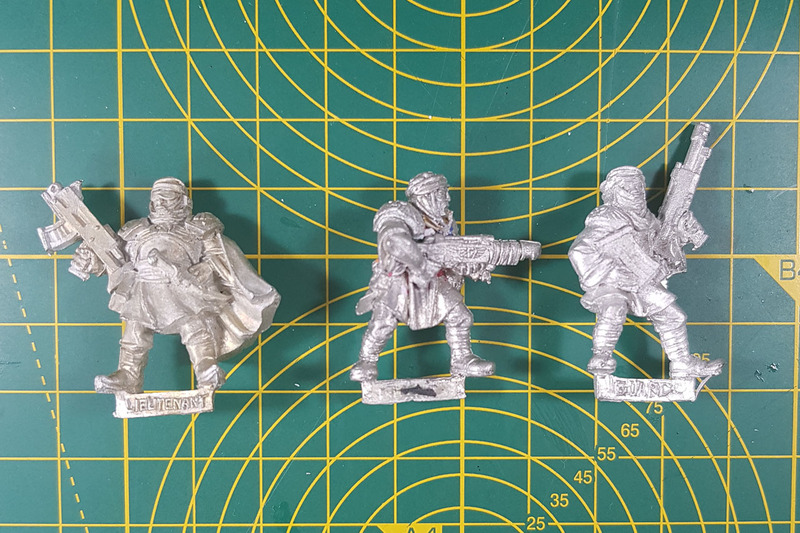 Do not wonder, if some of the older miniatures you're looking for are casted in White Metal. 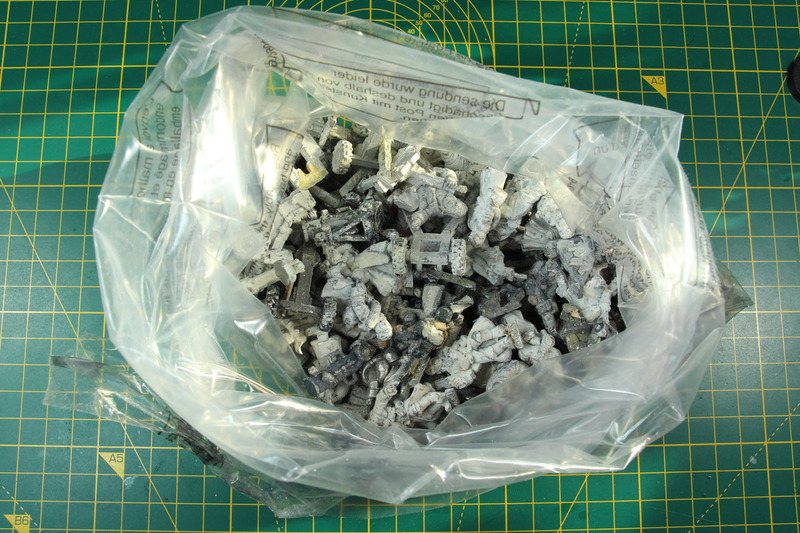 Games Workshop offered Mail Order casts for a long time, even of some of the old Realm of Chaos miniatures and such. 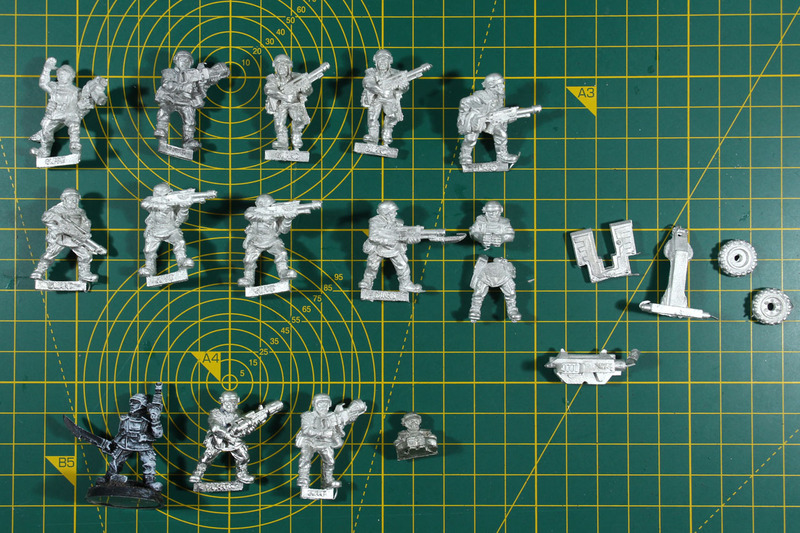 Just be sure, to be aware that some of the rare / oop miniatures, can be counterfeit or recast. Don't buy these, as you're getting ripped off for a bootleg. 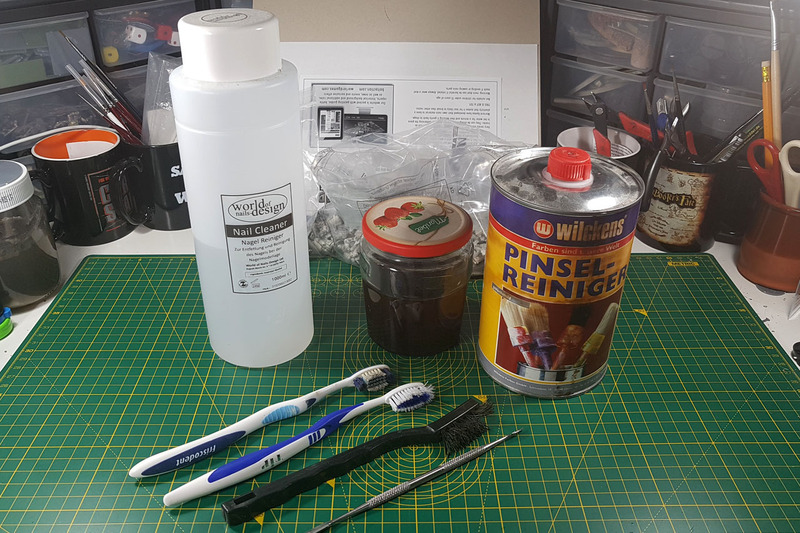 When handling used miniatures, you will need some tools. Collect some old (tooth) brushes, get a few containers and get yourself a fitting paint stripper (depending on what kind of material you handling). And don't forget to protect yourself. 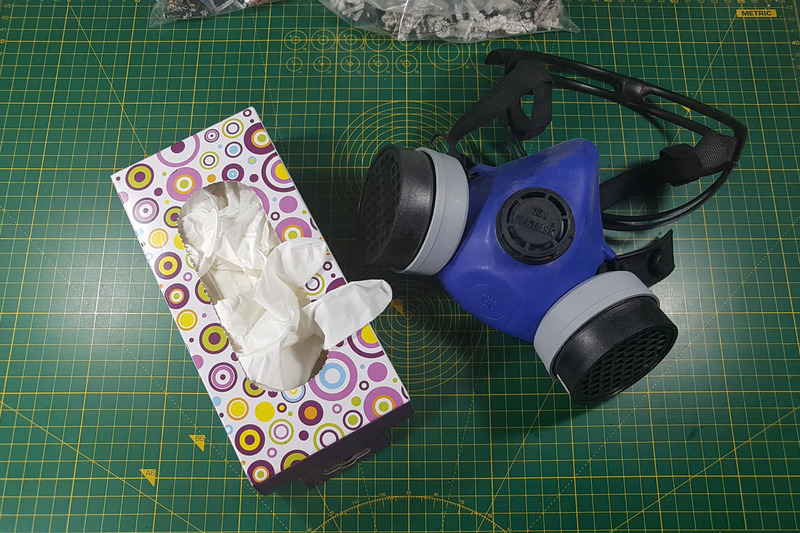 Use surgical gloves and respiratory protection, as some of the liquids are aggressive towards your skin and/or develope fumes. As stripping paint can be a long ongoing and / or repetitive process, collect what you want to strip and work in batches. 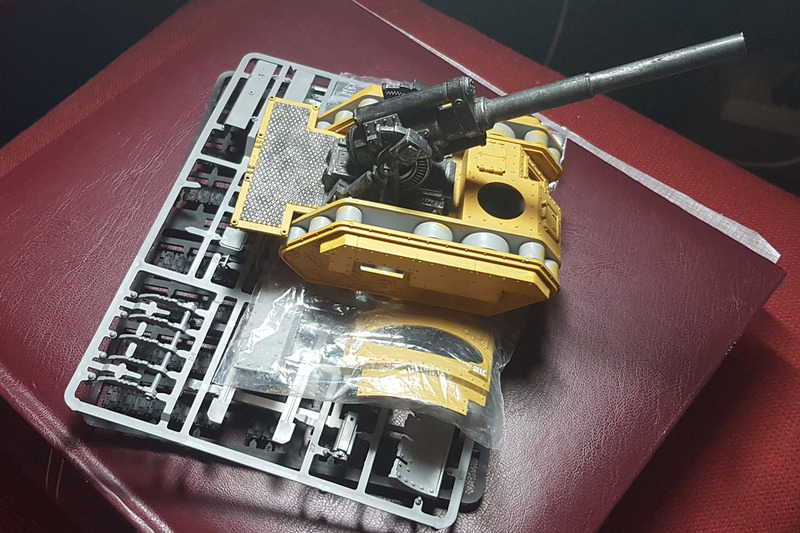 Inspect the models carefully to ensure, that when you're going for the stronger stuff, you only strip metal miniatures and there are no plastic, resin or green stuffed parts that will be damaged during the process. Let the miniatures rest in the liquid, at best over night, and then go to work with the brush. I usually clean them in some lukewarm soap water and let them dry on a piece of paper towel afterwards. In the third picture you can see some metal miniatures, who got all the same treatment, but the results vary by a bit. So, to sum it up. Make sure you know what you're looking for and what it is worth to you. The other steps, like searching for old miniatures, cleaning and restoring the miniatures, will be covered in more detailed, individual articles. 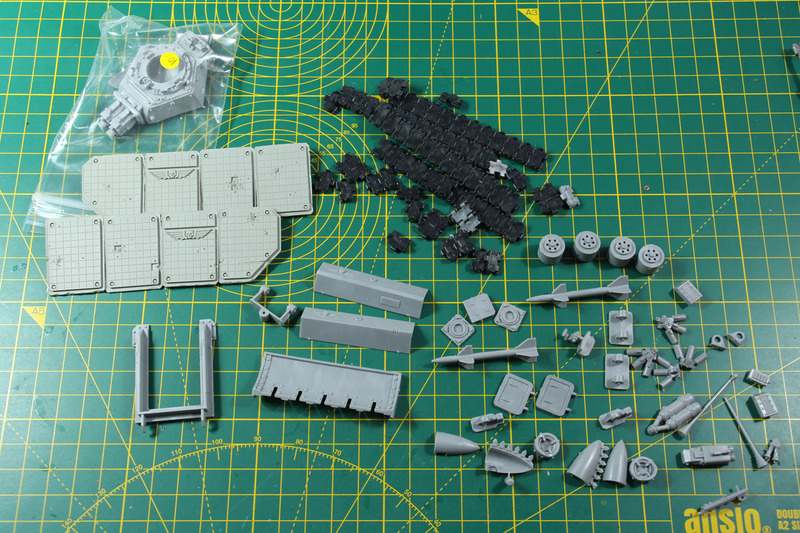 It will come in handy, if you have some tools, like the ones mentioned above, and sorting boxes to store the miniatures and bits during the collection. Until then, I suggest some old White Dwarfs or oldhammer blogs, like Realm of Chaos 80s, Leadplague or the Oldhammer board.